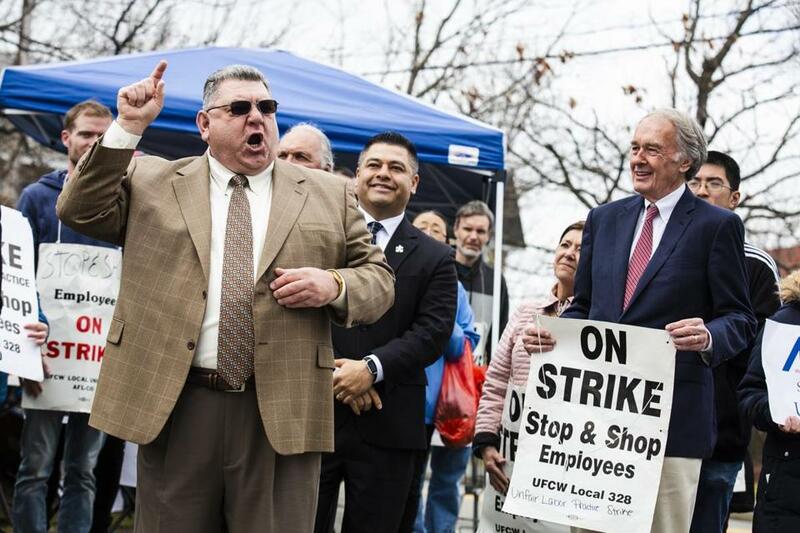 Brian Brusseau (left), member of the Roofers Union Local 33, and Senator Edward Markey spoke in support of the United Council of Food Workers who have been picketing outside of Stop & Shop in Quincy for the past four days. Union powerhouses that used to reign over swaths of the New England grocery industry have either consolidated or have fallen into disarray. Last Thursday, when 31,000 Stop & Shop employees walked off the job in Connecticut, Massachusetts, and Rhode Island, it was one of the largest supermarket strikes in 15 years. It might also be a last stand for unionized grocery workers, whose stores are under attack by a host of competitors, all looking to grab a piece of the supermarket bounty. “Stop & Shop is the last, best, and final hope for the great Roman empires of unionized food retail chains,” said Burt Flickinger, a grocery industry analyst with the Strategic Resource Group. Stop & Shop, one of the last remaining union shops in the industry, is the largest grocery store chain in New England. But the dynamics affecting its fortunes reach around the world; over the last two decades, the company has been buffeted by the forces of consolidation and globalization and by the rise of the Internet. In the late ’90s, as Walmart used its vast supply chain network to push down prices and extended its reach in the United States, Stop & Shop and other legacy unionized grocery stores sought to fend off the big box chain through acquisition and consolidation. One by one, union powerhouses that used to reign over swaths of the New England grocery industry, including A&P, Pathmark, and Grand Union, fell into disarray. Stop & Shop, which was acquired by Netherlands-based Royal Ahold in 1996, stepped in to scoop up some of the languishing players. But in the process, it acquired their pensions and other benefit plans, some of which are now at issue in the ongoing labor dispute. Ahold Delhaize, now the fourth-largest supermarket owner in the United States, also owns the Hannaford and Food Lion chains and the Peapod delivery service. Today, there’s even more competition. Hawkins said traditional grocery stores have seen the coming tide of e-commerce for the last decade but have only moved to respond in the nearly two years since Amazon acquired Whole Foods. “What Stop & Shop and others are bumping into,” he said, “is [that] what it means to be a supermarket retailer is shifting in terms of consumer expectations.” Customers now have an different, and higher, set of standards on factors such as delivery, costs, pick-ups, and online purchases. Flickinger also said that the cost of benefits can be difficult to convey to union workers. “It really becomes a challenge to communicate to the team members at the stores that while the compensation could be going up 5 to 8 percent,” other factors, like filling the hole in an unfunded pension plan, providing a robust health insurance package, and accommodating new minimum wage laws, hurt profit margins, he said. Especially when primarily nonunion players like Aldi and Costco can run their payrolls at a fraction of the cost. Meanwhile, nontraditional players are fighting to grab a piece of the grocery industry pie. When bulk-buying club stores, including Costco and BJ’s, first opened in New England, Flickinger said, about 30 percent of their stock were supermarket items, as opposed to paper goods, electronics, and the like. Today that number is more than 70 percent. The same can be said for Walmart and Target, which started with about 35 percent of their sales in grocery-related items. Now those numbers are closer to 75 percent of their sales. Drug stores such as CVS are also stealing market share, driving consumers in with big discounts on items in traditional supermarket “power aisles” including cereal, tea, canned foods, and coffee, he said. And family-owned grocery stores — Big Y, Roche Bros., Market Basket, and Wegman’s — all have loyal followings and stand ready to scoop up shoppers turned away from Stop & Shop. With Amazon slicing prices at Whole Foods and well-funded delivery options such as Instacart using their technological prowess to serve shoppers whenever they want, it really has become a perfect storm for the unionized grocery stores like Stop & Shop to withstand. One consideration to watch is how well customers will deal with the ongoing strike and whether they’ll stick with the brand. New Englanders are uniquely loyal to their grocery stores, analysts said, as proven by the scenario that played out in the aftermath of the Market Basket shutdown in 2014. The stores bounced back phenomenally in the wake of the temporary closures, said Scott Sanders, who runs Boston consultancy Growcery Partners. And the timing might benefit Stop & Shop and its workers; given the increasing attention to workers’ rights on the political left, especially among millennials, some shoppers may make a point of returning to Stop & Shop after the current crisis ends. According to statistics released in February by the Department of Labor, 2018 saw the highest number of employees going on strike since 1986. Sanders, who consulted with Stop & Shop at a previous job, said the store’s managers had been trained to operate cash registers and stock shelves in the event of a strike. The question, he said, was how well they’d be able to manage those jobs along with their own.